Use apt-get or yum to install the NTP daemon. Ensure the /etc/ntp.conf file contains 4 NTP servers. Instead of "distro" being listed, the name of the distribution should be listed, such as ubuntu, redhat, or centos. Your NTPd server will get time from these 4 NTP servers. To confiure your local NTP server to allow other computers in your network to use the machine as the NTP server, enter your network address and prefix. Start the NTP daemon, and ensure the daemon is active and running. Configure the NTP daemon to automatically start if the OS is rebooted. Use the date command to verify the NTP server is getting the correct date and time from the NTP pool. Client PCs in your network can now be configured to use your NTP server. 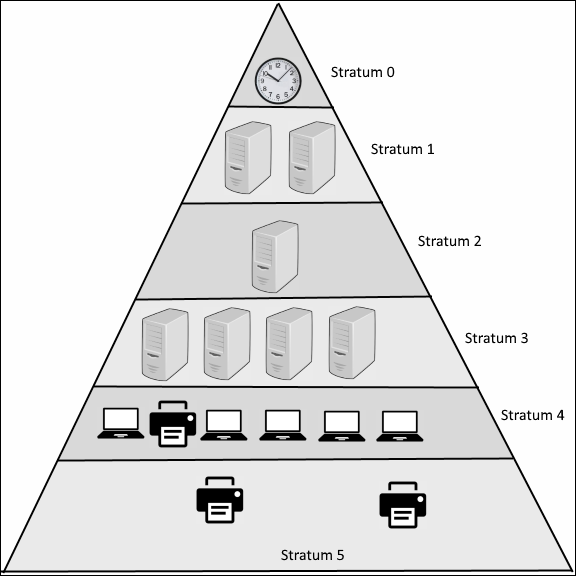 NTP uses a term stratum to describe how far a device is from the reference clock. Stratum 0 is the reference clock. Stratum 1 are the ntp.pool servers. Stratum 2 is typically an internal NTP server. Stratum 3 and below are devices in the LAN that are configured to use the internal NTP server. Stratum can be 16 layers deep maximum.